Liberty Park WTC Vent D by AECOM. White fritted glass; ventilated glass facade element. Photo by Said Elieh. A decorative ventilated glass facade by Bendheim presents an aesthetic solution for WTC’s Vent D structure. The utilitarian edifice, framed by Greenwich Street to the east and the future WTC Tower 5 to the south, provides ventilation for the parking structure below the Liberty Park pedestrian plaza. The vent’s sensitive location – atop the elevated walkway in the south-east corner of the new park – required an elegant facade that would harmonize with its beautifully landscaped surroundings, while providing the required moisture protection and ventilation benefits. The brilliant white glass creates a clean, bright exterior, transforming the utilitarian structure into a good neighbor to Santiago Calatrava’s upcoming St. Nicholas church. The brilliant white color of the glass is derived from color-stable white frits, permanently fired into the back surface of ½” ultra-clear (low-iron) glass. The back-ventilated Wall-F glass cladding system stops over 90% of wind-driven moisture. The remaining >10% dissipates through drainage and evaporation. 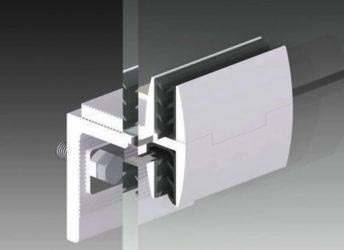 Simultaneously, the open joins of the system ensure continuous air flow, assisting ventilation.